My summers seem to come in two flavors. Either they are long and lazy months when I peacefully chew through piles of books. Or they are dizzy months with a near-constant stream of visiting family/friends interspersed with short stints of travel. Summer 2015 definitely falls into the latter category and I'm enjoying every bit of it. The way I eat has changed quite a bit this year, but when friends and relatives come to stay, I pull out all the stops and make the treats that I know they're looking forward to. 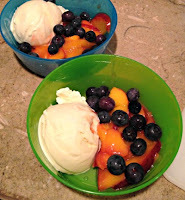 The first dessert of summer came with Father's Day last weekend. We got together with a couple of families and hosted a potluck for the daddies. For appetizers, we had sev puri, bruschetta with grilled peaches and blue cheese and fried eggplant rolls stuffed with goat cheese. Then we had falafel, spaghetti squash enchiladas and vegetable tian (a kind of deconstructed ratatouille). Everything was delicious but the hit of the evening was the dessert. 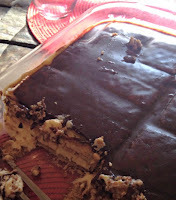 I made no-bake Boston cream pie strata, a no-brainer for Father's Day knowing Lila's daddy's love for custard. I followed the recipe exactly as written, and it was fantastic. The pudding is cooked on the stove top and layered with store-bought graham crackers- an "icebox dessert" with no baking required. It is a messy, homely sort of dessert perfect for a casual gathering in summer. It is the sort of comforting dessert that takes people back to their childhood. I say this because one of our friends actually said, "You remind me of my mother" which left me speechless until he explained that his mother made something just like this! Pudding has lately become the dessert of choice in our home as a way to use up extra egg yolks. Lila's gotten into the habit of eating a fried egg in the morning, but does not like the taste of yolk and insists that I separate the eggs. Miffed as I am (yolks are very nutritious and if you're choosing to eat eggs, it makes no sense to leave out the yolk), I pick my battles and keep the egg yolks aside. When friends from St. Louis visited us this weekend, I made chocolate pudding, and just as the recipe promises, it tasted perfect- just like a dreamy mousse. Summer fruits are the highlight at this time of year in Georgia- watermelon, peaches and blueberries. The watermelon we simply cut into chunks and store in the fridge, as a refreshing snack to take to a picnic or to eat when you step into the house from the sweltering heat. The local blueberries are tiny and perfectly sweet and delicately perfumed. The peaches, likewise, smell as sweet as they taste. We've been serving sliced peaches and blueberries with a scoop of good quality vanilla ice-cream for a no-fuss summer dessert. I happen to love Trader Joe's French vanilla ice cream. Sometimes I saute the peach slices in a bit of butter and rum, and sometimes not. Either way the taste is divine. 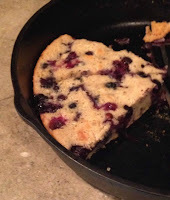 I wanted to showcase the blueberries in a farewell pancake breakfast for our friends who were driving off, and remembered seeing recipes for pancake batter that is baked in the oven in a large pan. It is a great alternative to standing over a stove making individual pancakes for a crowd. This recipe is inspired by various recipes I found on the Internet. It turned out beautifully and is something I'd definitely make again- there are all sorts of seasonal variations one could do. 1. Preheat oven to 375F. Place a 10 inch (or 12 inch) cast iron skillet in the oven while it preheats. 4. Stir the wet ingredients into dry ingredients gently- don't over mix the batter. Some lumps are fine. 5. Pull the skillet out of the hot oven and add 1 tbsp. butter, swirl it around to coat the bottom and sides of skillet. 6. Pour in the batter into the buttered hot skillet and scatter 1.5 cups fresh blueberries on it. 7. Bake for 25-30 minutes or until cooked through. Cut into wedges and serve with your favorite pancake toppings- we like butter and real maple syrup. 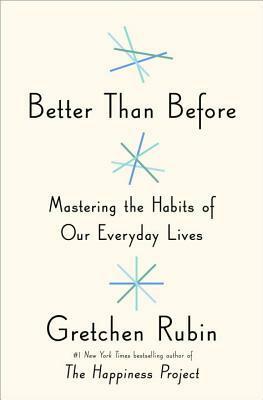 I read an interesting book last week- Better Than Before: Mastering the Habits of Our Everyday Lives by Gretchen Rubin. I have been reading Rubin's blog for several years and she liberally posts excerpts from her books on her blog, so I felt like I had read bits and pieces of the book already. Still, it was nice to read it all in one place. Rubin starts by explaining why habits are important in the first place. For good or bad, habits are the invisible architecture of daily life. In many ways, our habits are our destiny. Once you identify good habits that you would like to cultivate, or bad habits that you would like to outgrow, that's where the book really comes in: it identifies several strategies that we can use, in line with our own natures, to make the habit stick. To shape our habits successfully, we must know ourselves. We can build our habits only on the foundation of our own nature. A lot of the book is devoted to this figuring out what makes you tick. For instance, to see how a person responds to expectations from oneself and others, Rubin has developed the four tendencies framework. Just for fun, I made V take the quiz in the book- which he did with a bit of an eye-roll- I know he thinks such quizzes are a little woo-woo. I thought (and still think) of myself as an obliger, but V pointed to the upholder section and said, "That's you". He's more of a questioner. In any case, I know that I'm the sort of obliging, rule-following person who likes having habits, developing new habits and reading books about habits! I definitely use habits to get routine work done and out of the way, leaving me time and energy that I can put towards doing things that are either fun or meaningful or both. For instance, a few years ago, I would have a conversation/battle with myself every single evening about doing the dishes after dinner. Should I wash the dishes? Am I too tired- should I leave them for tomorrow? Can I go do something fun, then drag myself back to the kitchen to do the dishes? It was so tedious and a total waste of time- because dishes don't wash themselves no matter how much you dawdle and hope that they do. I finally got into a streamlined routine- we finish dinner, I do the dishes (it actually takes only a few minutes when you time it) while V gets Lila ready for bed. I've made a ritual out of it- after washing dishes, I wipe the counters, tidy the kitchen and put the dishwashing sponge in the microwave to sanitize it. That's my cue that the day's chores are done and I can enjoy the rest of the evening. The next morning, it is a pleasure to start the day in a clean kitchen. A banal habit, but one that's definitely made my life better. (I do want to extend this habit to giving the kitchen floor a quick sweep and mop too). My other favorite habit- zero inbox. I either reply to e-mails right away, or archive them if I don't need to (or want to) answer them. I usually have zero e-mails in my inbox, and never more than 5. Checking e-mail too frequently- now that's a habit I am still working on. Rubin discusses how people often fall into one of two groups- whether a person thrives on competition or cooperation, likes to be active during the morning (lark) or evening (owl), likes to overbuy or underbuy, likes simplicity or abundance. It was fun to see where my own nature fits in: I don't like competition (except with myself), I thrive on cooperation, I am 100% a lark- a morning person, an underbuyer, a simplicity lover, a familiarity lover. The book urges you to ask yourself questions on how you like to spend your time, what you value and your current habits. The pillars of habits are strategies that can be used to establish habits. I find that I'm already using many of these, and I agree that they are very effective. For instance, I use the strategy of scheduling (just putting an habit on the calendar) to go to my thrice-weekly fitness classes, and it works very well for me. I use the strategy of inconvenience to stop myself from over-eating salty fried snacks- I simply stopped buying potato chips, tortilla chips, chaklis on a regular basis- and if I don't have it in the house, I can't eat it. Sure, I can get in the car and drive to the store and buy some, but I'm way too lazy to do that. Rubin has many interesting insights into habits. We must all pay, but we can choose that for which we pay. For instance, I can go to bed early and miss out on watching TV, or I can stay up late watching TV but miss out on good sleep and feel groggy the next day. Either way, I pay a price, but I get to decide what is worth more to me. Habits multiply, for better or worse, within individuals. So true. I started this year wanting to make just one small change, and it snowballed into something much bigger as the habits multiplied. They also spread from one person to another. Again, this has been so true for me. Habits are truly contagious. I've caught the evening walk bug from my neighbor. Some friends have said that they've gotten into the habit of cooking vegetables from eating at my house. I can't make other people change, but when I change, others may change; and when others change, I may change. How are your habits working for you? Do tell! I read this book recently too! Here's what I took away from the book. I learned a surprising fact about myself that I am not an obliger but a questioner. After reading this book I decided to put to work the "strategy of monitoring" she talks about and started tracking with an X on my calendar (in different colors) the days that I 1) go to yoga 2) swim 3) get to 10,000 steps and 4) eat entirely at home. I am happy to report that this simple act has had a HUGE impact on all 4 goals. Inspired by an example from the book I issued a challenge to my husband .. 3 workouts a week or I will buy a giant bottle of Fiji water that week. He hates buying bottled water so he's been really good with meeting and exceeding his 3 times a week workout goal. It's been the much needed push he needed to get him back on the wagon. Do you listen to Gretchen Rubin's podcast? It's really good. I do enjoy Rubin's podcast (and often listen to it while doing chores) but haven't caught up with all the episodes yet. Good for you for putting the tips to use, and finding that they work!! I'm sorry to hear that :( but it does not have to be that way. There are many books and online resources out there and if you want to, you can try different ways to embrace good habits one at a time. Good luck! All the deserts look yummy! we in India can use Marie biscuits instead of crackers.. i guess. i have a very bad habit of procrastinating. please help me find a way to get rid of it. i have quite a few important projects, including Ph.D on hand, but this habit of mine makes things difficult! Anon- Only you can help yourself get over the habit of procrastinating :) The good news is that there are resources (books, websites) out there to suggest ways to do it. And you have identified the problem, which is the first and crucial step. I find that I have to do a lot of thinking and reflection on why I do (or don't do!) things, and then I can change matters. What an interesting post, Nupur. I couldn't finish reading the book before it was time to return it back to the library so thank you so much for sharing about it here. Talking about habits, the most difficult thing for me is to be consistent with anything I do, I really have to struggle to make something a habit, maybe because I am a questioner I don't get easily convinced but once I overcome that then I'll follow it proactively but that initial struggle is very difficult and testing time for me and can sometimes take a long while. Having visitors is also a testing time for habits, some deeply inculcated good habits may actually clash with others habits. Simple things like having a good breakfast or early dinner are the first to let go but habits like having a peaceful start to the morning versus others habit of chanting their morning prayers loud enough to reach the heaven are really difficult to deal with. :-)) Both habits are good for the respective people but not so for others. Priti- I have had (and will have) many visitors this summer and completely agree that keeping up with habits during this time can be a challenge! I'm trying to come up with solutions that are agreeable to both parties. I must say that I am in the habit of putting myself first and don't hesitate to eat at whatever time I like, and will serve the guests at the time they prefer. Last week, I had a friend visiting for a few short days and instead of saying "let me miss my gym class so I can spend maximum time with her", I asked her to go along so we could take the class together and we both enjoyed it. I'm glad I thought to ask her! My challenge has been to cook hearty meals for guests while I myself have been eating lighter these days and skipping things like bread and rice which others find to be an absolute must in a meal. Priti brought up a good point. I always struggle with dinner time when we have guests over - especially people from India who are generally used to having dinners pretty late. I have started using acid reflux problem as an excuse to let me finish my dinner early. One really shouldn't need an excuse to eat dinner on time, but it seems more polite. Thanks Nupur and Snehal. I tried doing exactly as Nupur has shared and I thought that I was able to strike a good balance but just as Snehal mentions people still find it weird. Some express their displeasure openly some discreetly. I took my mom to zumba when she was visiting but it really depends on the guest, their interest and enthusiasm. Mostly the guest feels entitled to all our time except when we are away at work since they have traveled to visit us they think we should atleast sacrifice our routines to spend most time with them or entertaining them. I did get away from having to drink tea in the evening by giving 'acidity' as an excuse but it is not always taken well by others and I am always suggested home remedies instead of ditching the tea which is unthinkable for most. My mom visited us few weeks back and every time we talk now she asks me if I still eat an early dinner and not feel hungry later. She hopes its a passing fad :-) and I will get over it. I am stickler for habits and routines. I keep a daily planner and enjoy ticking off my to do's. I think its a bit too much but it helps me prioritize what I need to get done and do the tasks I would otherwise put off. I would like to work on minimizing my inbox though…thanks for the motivation! Arpita- Like you, I make lots of to-do lists and can't live without my calendar. I would never remember the things I need to do otherwise! I read Gretchen Rubin's book and while it was an interesting read, the mostly anecdata instead of actual studies put me off. I think I was influenced by reading The Willpower Instinct by Kelly McGonigal not long before I came to this book and that is much better researched, better written and quotes actual scientific studies instead of a whole lot of stories about family and friends. I'd recommend that book very much if you can get a chance to read it. I'll definitely look for The Willpower Instinct- thanks! I know what you mean about anecdotes, the personal stories tend to be, well, too personal and sometimes it is difficult to relate to another person's life. I do love Gretchen Rubin's pithy insights into human nature. As always a though provoking post. I have never read Gretchen Rubin, so thank you for the synopsis on her book. As a kid I was a total happy go lucky child, always doing my work in the last minute. But once I had my own household and that too being a working mother always, I have become a creature of habit and thrive on familiarity and routine. I still am not sure where along the way I transitioned into this organized person because it was not a planned one. I am looking to improve my eating habits and exercise habits which have deteriorated due to some health challenges. Your posts always inspire me to do better and will also read Gretchen Rubin. SS- Yes, when you have to juggle a household and a job and kids, I guess being organized is just about the only way to stay somewhat sane. Good luck to you! I make pancakes for lunch on my kids' birthdays and am happy to see the recipe for the baked one. A time saver! Thanks! Angel- and you could stick a candle in the pancake and sing happy birthday as well :) I think I'll have to adopt this cute birthday tradition! I took the quiz and got "questioner". But Frankly speaking on numerous occasions I fit perfectly well into the "rebel" category (as in, why the heck should I be bound by any rule kinda thinking). But lately as I have aged (erm become wiser) I have realised that rebelling for the sake of rebelling is futile. People who know me will still list being a rebel as one of my quality, but I think I have started questioning things a lot past few years! Anywho, few of my long lasting habits which have persisted over many years now are: Reducing the wants in life (best habit ever for peace of mind), making healthy choices whenever possible and buying stuff only if I need it and not because its cheap/on sale! Can't agree with you enough about not buying unnecessary things. This Spring I made an effort to stay away from yard sales (I don't like to shop but have a thing for rescuing kitchen ware and things from yard sales) and it has been great not to bring more clutter home. You sound busy in a good way - that boston cream pie looks excellent- I love the comment about being like the guy's mum. I took the quiz and got obliger - sounds like an interesting book. Johanna- The Boston cream pie really is a great dessert, I can see myself making it again soon because it was such a hit the first time! Every year my employer attends a covered-dish dinner Independence Day party. I'm his housekeeper, and I always want to make a great dish to send with him. Your Boston cream pie looked perfect, but...for the very first time, there was no party this year! So I'll have to set this recipe aside for another covered-dish dinner sure to come. Thanks for publishing this!